Have you seen Trump’s new Hillary Ad? If you haven’t, you ought to check it out…it is pretty powerful. You can catch it HERE. This is the same ad that YouTube has very clearly made it difficult for the American people to view. They had the audacity to tag the video as ‘unlisted’ and furthermore took steps to add a warning. 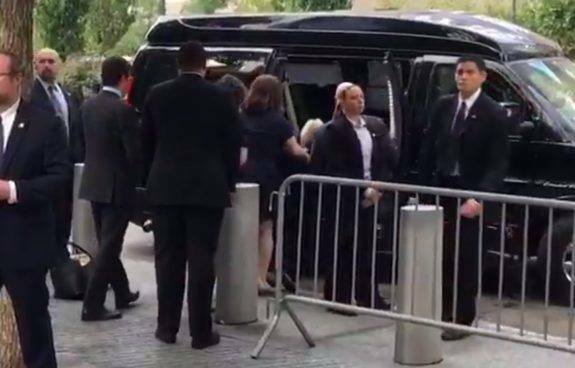 This is a video that the Trump team released this Tuesday morning setting focus on Hillary’s health both mentally and physically and stating that these are a threat to national security with a warning that Hillary Clinton lacks the stamina and judgment capability to keep America safe. Which, I couldn’t agree with more. I’d even take it a step further and ask the question…if she did have the stamina to keep America safe, would she? I guess it would depend on whose payroll she’s making her millions from…because it certainly isn’t going to be the payroll of the U.S. President that satisfies her big money hunger. I’m just about done with this stupid planet and let me tell you why. Democrats refuse to let people think for themselves and that is one of the most frustrating things for me to witness. My 8 year-old thinks more for himself then any Democrat and he’s so much better off for it too. SHUT the hell up. If we watch the video and it aligns with what we agree with and want to share with our friends and family… then shut the hell up, we will share it. We don’t need liberal YouTube telling us to think twice. How dare they think we do. The Drudge Report featured a link to the video Tuesday, bypassing YouTube’s effort to keep people from viewing the Trump ad. Thank you Drudge Report for allowing people to think for themselves. This is how the Democrats dumb down a nation. This is how stupidity takes over and drives out any common sense. They do everything they can, to ensure people don’t think for themselves, after awhile… they stop thinking at all. Are you going to allow YouTube to keep this from getting out?